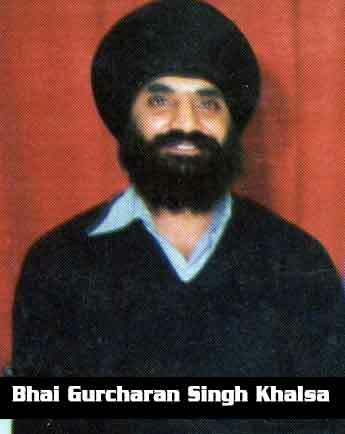 Shaheed Bhai Gurcharan Singh Khalsa was born in Kenya africa his parents were Bhai Amar Singh Khandola and Mata Gaian Kaur bhai sahib had one older sister called Satvinder Kaur and one older brother who is a panth douki Tari Khandola, he was the 3 oldest out of seven kids. He was a very funny and loveable person we would always want to make every one laugh and joke about once before they came to England it was Dewali in Kenya so his dad wanted to got presents for all the kids ,,, from childhood he loved learning about gursikhi althought his parents were not amritdhaari when they came here. At the age of 21 he got married to Harpal Kaur but even then he didn’t srop his little pranks on people. He had a little betie in 1974 called Gursharan Kaur and then in 1980 a son called Gurpreet Singh. When Gurpeet was born he was in jail at the time for drug dealing in jail he learnt Gurmukhi and started keeping his kesh, and he even learnt Gurbani Paath with guru jee di kirpa. In 1982 while in in prison he wrote a leeter to his wife asking her to get him a dastar and she went to the gurdwara sahib and did a ardas and gave him the dastar then in 1983 he was free and cme home wearing a black dastar, and live accoreding to gurmaata and in that same year he again was blessed with a second son who they called Inderpal Singh and did a Akand Paath thanking guru jee. Attack On Harminder Sahib/ June 1984. In early 1984 he along with his singhnee, nephew and his singhnee begged the panj pyaarie for Amrit and from that day forward lived for gursikhi until his last breaths. After taking Amrit he stoped all his pranks and started jaaping naam 24 hours a day he would get up at 12 clock have a isnaan and until 2am would do Waheguru simran then from to until 6am do his nitnem and then eat. In June 1984 darbar sahib got attacked theis affected him so much that every pore of this body wanted to punish the gulitey people and in same same june month his singnee gave birth to his thired son which he named after shaheed gen Subegh Singh jee and started Gurmat Camps in in 1986. At the Walsall Gurmat Camp Bhai Gurcharan Singh Khalsa is sorely missed. I have never come across any Sevadar of the camp that commanded and received the respect that Bhai Gurcharan Singh Khalsa did. He was a great role model for the children of the camp to look up to and aspire to be like. I remember the manner in which all the boys attending the camp including myself used to get scared of even the mention of Bhai Gurcharan Singh Khalsa’s name. The boys did used to get restless at night in their sleeping quarters as would be expected from children, and the Sevadars who were in attendance used to say that they are going to call Bhai Gurcharan Singh Khalsa to calm us down, all the boys would fall silent at this and would go to sleep at once. The Walsall Gurmat Camp has brought forward many Panthic Sevadars from varying backgrounds and nurtured many children towards Sikhi.